HM The Queen, accompanied by HRH The Duke of Edinburgh, unveiled the Iraq and Afghanistan Memorial at Victoria Embankment Gardens in London on 9 March. The new Memorial recognises the contributions of the UK Armed Forces and all UK citizens who deployed in the Gulf region, Iraq and Afghanistan from 1990 to 2015 and those who supported them back home. 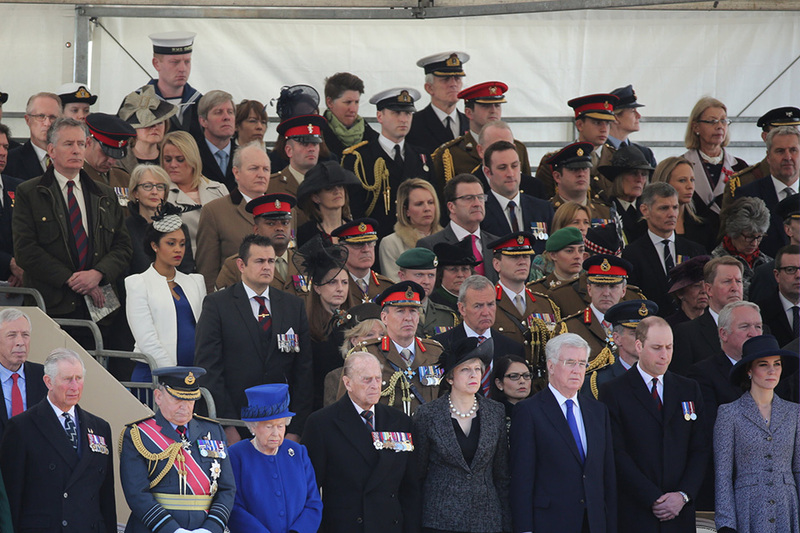 During the unveiling, a Service of Dedication was conducted from a specially constructed Drumhead on Horse Guards Parade with The Queen, Prime Minister Theresa May and the Defence Secretary, Sir Michael Fallon, in attendance. They were joined by His Royal Highnesses The Duke of Edinburgh, The Duke and Duchess of Cambridge, Prince Henry of Wales and other Members of the Royal Family. Readings were given by Prince Henry and a Ministry of Defence Civil Servant Victoria Whittaker who deployed to Afghanistan in 2014. Following the Drumhead Service, the Memorial was formally unveiled at a short ceremony in Victoria Embankment Gardens, in front of the Ministry of Defence, where Her Majesty The Queen met a small number of civilian and military guests who contributed to the Iraq and Afghanistan conflicts, and Memorial Trustees. 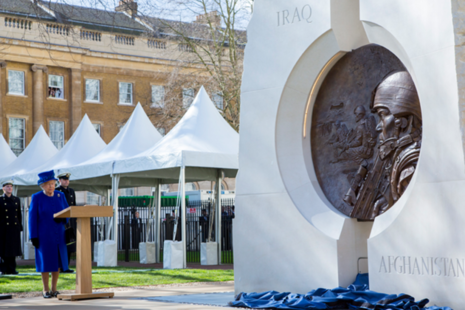 The new Memorial features two large stones â€“ one representing Iraq and the other Afghanistan â€“ linked by a giant, two-sided bronze tondo depicting the Memorial’s theme of â€œDuty and Serviceâ€. The Memorial gives equal prominence to military and civilian contributions, including, among others, the delivery of healthcare and humanitarian work. It is specifically intended to be inclusive of all those who contributed and therefore bears no names. Between 1990 and 2015, thousands of British citizens put themselves in harm’s way, protected our nation’s interests, helped those in danger and worked to improve the lives of those in other countries. 682 Service personnel lost their lives in the three conflicts. Civilians from a vast breadth of organisations worked for more than two decades in areas such as aid distribution, education, healthcare and governance to help the citizens of both Iraq and Afghanistan.